Wholesale purchase of natural marble stone means a tremendous cost savings if the material is obtained from a direct importer and distributor. Stonexchange is a manufacturer and wholesaler of premium quality marble tiles, window sills, and thresholds, and one of our most popular marble tile products is Adalia Cappuccino, a medium-dark brown shade often used to complement lighter and darker shades of furnishings and wall surfaces. Although brownish in hue, Adalia Cappuccino is recognized as a warm tone that actually blends with off-whites very nicely.Contractors and installers needing an abundance of this shade can rely on Stonexchange to deliver top-quality tile at an affordable price. For an elegant design that includes the use of natural marble stone, a medium-brown shade is often desired. However, purchasing this material at wholesale cost and on a schedule that meets the expectations of the buyer can be problematic unless the supplier has direct access to this stone at any time of the year. The Nalboor Tiles website is a showcase for each type of natural marble stone available from Stonexchange, and our company promises rapid delivery and rock-bottom pricing on full-crate orders. Marble stone comes in a variety of shades and patterns. The rock itself is formed over millions of years, the result of tremendous pressure and heat. The beautiful striations and vein lines seen in most types of marble are the result of different rock compounds being squeezed together.The most popular shades of marble used in interior and exterior surfacing are off-white, ivory/beige, and beige/brown. The latter is often referred to as Cappuccino. This marble shade is rather bright and shiny despite its darker hue. Instead of thin vein streaks, beige/brown marble stone has splotching that varies in color from medium cream to yellowish ochre. Adalia Cappuccino has good light reflectivity despite its medium tone. 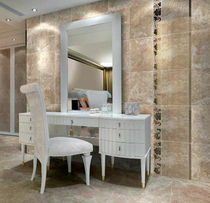 This color of marble tile works extremely well in areas such as hallways, kitchens, and bathrooms. Quite often, beige/brown marble is used in the bath area along with travertine, complemented by dark countertops, white sinks, and plenty of mirrors. Those who do not desire a jewel-toned bath often go for this medium shade of interior design.This color tone is also popular for use as a flooring tile in the kitchen. The shade complements light-colored cabinetry and black countertops very nicely. It stands out well against contemporary kitchen furnishings such as a dining table with polished steel legs and a glass top. Adalia Cappuccino shows little signs of wear and tear through the years. When properly polished by the manufacturer, this shade of marble resists scratching and scuffing, and most of the tiny inclusions that do form are hardly noticeable. An occasional wiping with a damp cloth and a waxing or repolishing procedure every few years is all that is required to keep this stone looking like new. Slabs of marble are extracted from a quarry using specialized cable saws. These slabs are thinned down into sheets and cut with machinery into square or rectangular tiles. Each tile is machine-straightened and given a surface polishing.The tiles are stacked tightly into a crate, and several crates are packed into an ocean freight container. The tiles are then shipped from their origination point in the Mediterranean to their destination in another part of the world. All of this – the cutting, shaping, and packing – adds to the cost of the material. The extreme weight of marble stone likewise increases the cost to ship the product overseas.Stonexchange is the manufacturer as well as the importer and distributor. In other words, we do not have to purchase raw material or pre-processed tiles from an outside party. Most of the marble tile seen in retail showrooms has been purchased and sold several times before it belongs to the end-user. Truly wholesale prices are enjoyed by those who purchase directly from the manufacturer.Because we operate our own manufacturing centers, we do not rely on seasonal supply from a second party. Our Adalia Cappuccino tiles are available year-round, and this is good news for merchants and construction contractors who may require hundreds or thousands of individual pieces on short notice. Stonexchange maintains a full inventory of marble tile at our Florida-based distribution center, and we ship to all corners of the nation.Stonexchange offers buyers two different sizes of standard tile squares. Our Adalia Cappuccino tiles are cut into 18-inch square and 24-inch square pieces. The 18-inch tiles are 1/2-inch in thickness, and the 24-inch square tiles are 5/8-inch thick. Both sizes of tile have been expertly cut and straightened, and the lower surfaces have been slightly smoothed to ensure proper placement on the supporting substrate material. The 18-inch square tiles are shipped in full-crate loads containing 351 sq. ft. and the 24-inch square tiles are delivered in full-crate loads containing a total of 260 sq. ft. of material. The lowest price offered is for these full-crate orders, but we will supply smaller amounts to customers at a cost that is still well below retail.Contractors and installers requiring full shipping container loads of material – up to 4,000 square feet – will receive the greatest price discount. These are the full containers loaded onto transatlantic vessels and sent directly to our distribution center. As our inventory shrinks, we place our own order for replacement material, meaning that our container load shipments can usually be processed and delivered from our warehouse in just a few business days.We take requests for non-standard size tiles. Because we manufacture our tiles at facilities owned by us, custom-size orders are never a problem. Our company does not charge extra fees for processing and delivery of custom orders. Some of these orders may involve a 2-month lead time, but we will offer our customers accurate delivery date estimates as well as a guaranteed price quote on non-standard orders.Merchants who carry natural stone materials such as flooring tiles will save a substantial amount of money when ordering in bulk from Stonexchange. We can set up a recurring order schedule for those retailers who need a constant supply of marble stone for sales to installers and subcontractors. We contract with several overland freight companies and can guarantee delivery dates in most cases. Our company can also deliver material directly to job sites or storage facilities if the customer desires. Our company manufactures and distributes full-crate or full-pallet orders of all types of natural stone materials. In addition to our line of marble and travertine flooring tiles seen on the Nalboor Tiles website, we produce and sell window sills, floor thresholds, shower curbs, soap shelves, paver stones, mosaics, and pool copings. Our window sills and thresholds are manufactured from the same marble and travertine used to create our flooring tiles.This means that customers will receive different products made using the same raw materials. The color and texture of our window sills and transition saddles will match the tone and style of flooring tiles, something that can be a problem for those who purchase from several different suppliers. We can mix-and-match orders with ease, meaning that installers will have all the material they need to complete an interior design project.It can be difficult to estimate the exact number of tiles needed to complete an installation project. This is especially true for multi-unit developments such as a condominium complex or a hotel remodeling job. Unlike window sills and floor thresholds that can be quantity-estimated with ease, flooring tiles are bit trickier. For this reason, we do not have a minimum or maximum piece requirement on any tile listed on the Nalboor Tiles website.Of course, the greater the amount purchased, the greater the savings. We will take a design idea or project instruction and give an immediate price quote based on the estimated number of tiles required to complete the job. Our lowest prices are given for full container loads of material because that is the method used to import the product, and our own costs are reduced for shipments brought to the United States in these ocean freight containers.Commercial clients also save a good deal of time looking about for the perfect color and style of marble. Many suppliers do not offer a specific marble type at certain times of the year because the manufacturer ramps down quarrying operations or has a long backlog of pre-ordered material. Stonexchange solves this problem for retailers and installers because we operate our manufacturing centers throughout the calendar year. Instead of piecing together the various marble products for your next installation project, contact Nalboor Tiles or Stonexchange today and learn how you can obtain the finest marble tiles at wholesale prices. Our customer service staff is ready to answer all your questions pertaining to order sizes, cost estimates, and delivery schedules. If you need premium quality Adalia Cappuccino tiles for an elegant design project, our company is ready to offer the best deal in the industry.